Last month, I told you about several October holidays that would help you ramp up your social. This month, I’m going to help you out with not only the holidays you should post about, but the messaging you could include on your post. Because that’s what we’re here for – to help you grow as a social media marketer. And, these templates I show for each holiday? They’re all available on PromoRepublic’s packed, layered content calendar of ideas. Movember is a month-long movement to raise awareness for prostate cancer, a disease that will be diagnosed in 1 man in 7 over his lifetime. During Movember, men grow out their moustaches to remind their friends and families to get screened for prostate cancer. It’s good to support such a good cause, and if you create a visually appealing, shareable post, your fans and followers will like and share it. 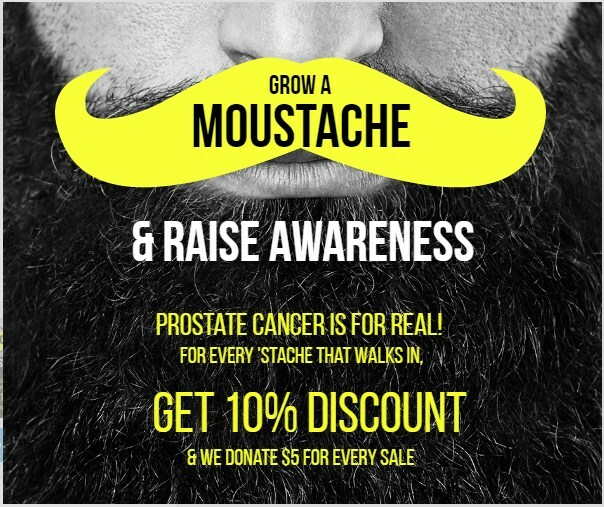 This post offers a discount to every person who walks in with their Movember moustache. By offering an incentive for people to participate in the movement, you are supporting a good cause and raising awareness, which is one of the best things to do with your social media account. A post like this allows people to bring valuable content to others, and to get the word out about prostate cancer awareness. You might even include a link to the Movember sign up page. I suggest posting this early on the first day of November, saving room for your other November 1st post. 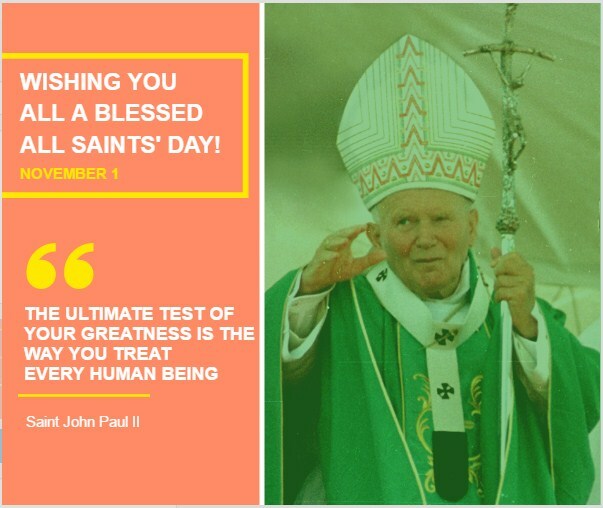 November 1st, the day after Halloween, is All Saints’ Day. Depending on your social audience, this could be a great post to share an inspirational quote, like we do in our template for that day. There are varying schools of thought regarding religious holiday posts on social media. Some brands are very careful and stay away from the appearance of regarding one religious faith over another. That’s where your audience persona comes in. With careful social listening, you can determine whether a post like this will resonate with your audience, or offend it. If you believe it would resonate, it’s a great, non-promotional, goodwill post that could get shared quite a lot. We included a quote by Pope Saint John Paul II, as he was not only a Pope, but an ambassador of peace to people of other faiths. Your brand and your audience will determine whether or not you post on this day, and the tone and message you choose to share if you do. 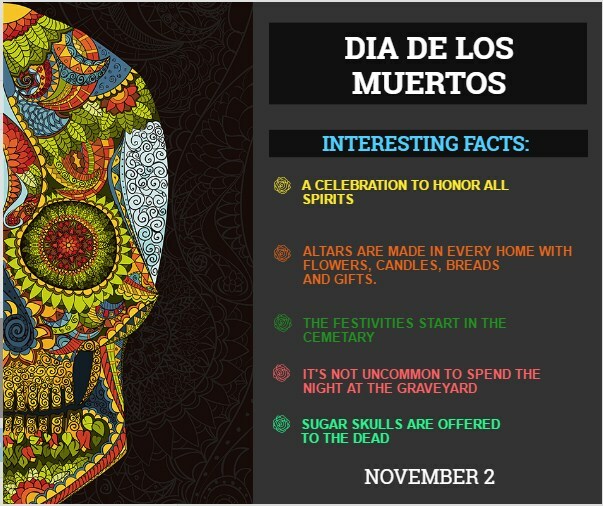 November 2nd, Day of the Dead, is a Mexican holiday that honors family members and friends who are no longer with us. In Mexico, the holiday lasts for several days, and ofrendas are built, and sugar skulls and marigolds are used to honor the dead. In the US, November 2nd is observed by some and well wishes are sent on that day. To educate your fans and followers, an informational post about this day is useful. Additionally, the aesthetic involved with the sugar skulls, in particular, has become very popular in the US. It is important, however, as a social media marketer, to avoid any claims of cultural appropriation or colonization of an indigenous holiday. So, if your audience is receptive to a respectful post honoring a rich cultural tradition, do so, but make sure you do it with sensitivity and class. 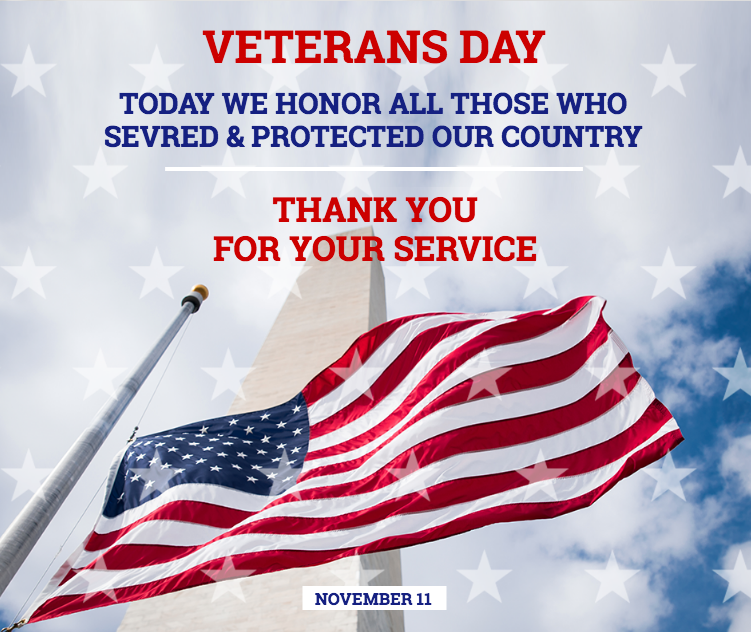 Veterans Day, November 11th, is a national holiday that honors people who have served in the United States Armed Forces. Not to be confused with Memorial Day – a day to honor soldiers who have fallen while in service to the country, Veterans Day is a day to recognize ALL people who have served in the US military. This is an important day to post on social media, because everyone knows someone who has served. Even though government offices are closed on Veterans Day (and as are some businesses), people will appreciate a visually appealing, respectful post they can share with family and friends. Studies show that Thanksgiving Day (Christmas too) has pretty low engagement socially. That doesn’t mean you should skip an annual Thanksgiving Day post. Just because people aren’t necessarily sharing, commenting, or liking posts, that doesn’t mean they aren’t looking. In fact, many social media experts recommend changing your page’s profile and cover photo to something seasonal in addition to posting on Thanksgiving. While engagement stats are low on Thanksgiving, they aren’t nonexistent. Posts like the one above encourage people to engage by sharing something with their families and friends. 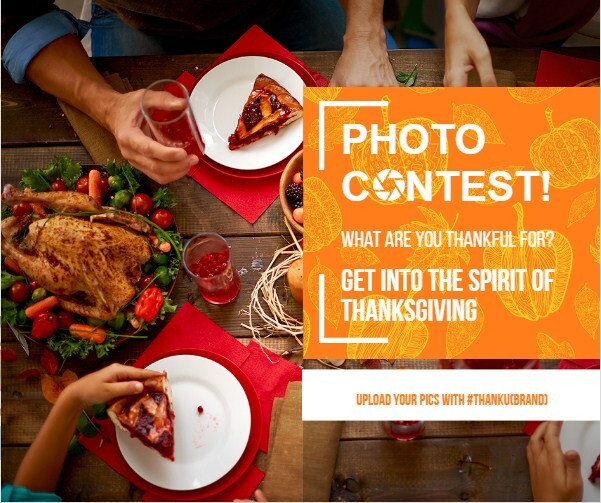 If you run a photo contest like this one, make sure, as people share photos, tag each other and share the post, that you like and comment when appropriate. When people see a brand engaging with fans and followers just for the sheer joy of brotherhood, it casts the brand in a good light. And, as a SMM, you get to see the nicer side of social media. Celebrated with tremendous amounts of retail shopping, Black Friday falls the day after Thanksgiving and it is commonly regarded as the first day of the Christmas shopping season and lots of stores open either extremely early, or stay open all night Thanksgiving night. 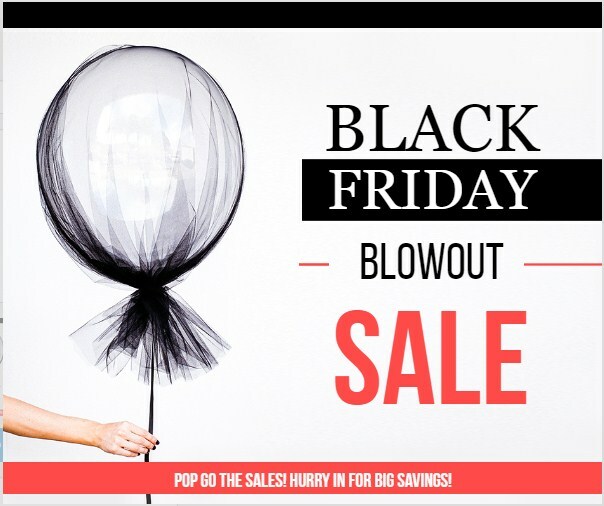 So, obviously, if you’re selling ANYTHING, it’s good to run a promotion for Black Friday. Why not do it with a really great visual post? It’s OK to keep a Black Friday post non-specific, especially if you have a brick and mortar location and you’re trying to attract foot traffic. As the day goes on, you may want to increase the percentage off savings on items or something similar to reduce inventory, so just letting people know that they should come in and check it out could result in quite a few shoppers. Speaking of shoppers, the brick and mortar and online retail frenzy doesn’t stop when people put away their credit cards for the evening on Black Friday. The Monday after Thanksgiving, people can find amazing sales on all sorts of items online. 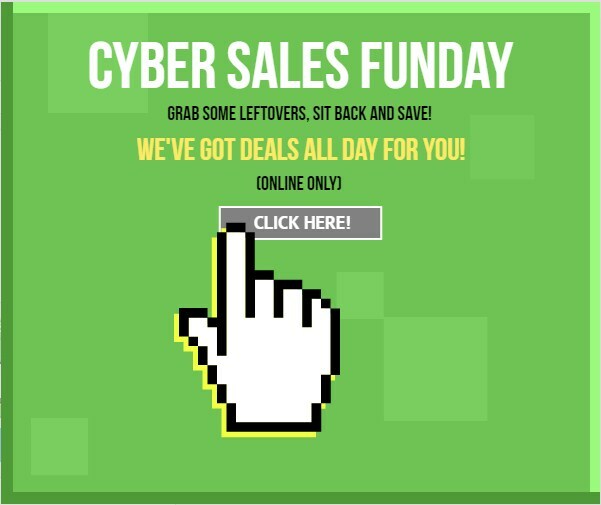 Cyber Monday is especially lucrative for online clothing retailers, but any company that sells online can post a Cyber Monday deal and see conversions. It’s a way for every company and every country to get in on the fun of Black Friday’s shopping habits, and it’s an especially great way for busy people to get shopping done from the comfort of their own home. And, if your deal is good enough, people will share, share, share. I’m always happy to give my content hackers some food for thought when it comes to social posts in a given month. To access all these templates and so many more, sign up for a free trial of PromoRepublic and see how easy your holiday marketing can be.